For Thanksgiving in Canada and the United States specifically, see Thanksgiving (Canada) and Thanksgiving (United States). For other uses, see Thanksgiving (disambiguation). Thanksgiving Day is a national holiday celebrated on various dates in Canada, the United States, some of the Caribbean islands, and Liberia. It began as a day of giving thanks and sacrifice for the blessing of the harvest and of the preceding year. Similarly named festival holidays occur in Germany and Japan. Thanksgiving is celebrated on the second Monday of October in Canada and on the fourth Thursday of November in the United States, and around the same part of the year in other places. Although Thanksgiving has historical roots in religious and cultural traditions, it has long been celebrated as a secular holiday as well. Jennie Augusta Brownscombe, Thanksgiving at Plymouth, 1925, National Museum of Women in the Arts, Washington, D.C.
Several days of Thanksgiving were held in early New England history that have been identified as the "First Thanksgiving", including Pilgrim holidays in Plymouth in 1621 and 1623, and a Puritan holiday in Boston in 1631. According to historian Jeremy Bangs, director of the Leiden American Pilgrim Museum, the Pilgrims may have been influenced by watching the annual services of Thanksgiving for the relief of the siege of Leiden in 1574, while they were staying in Leiden. Now called Oktober Feest, Leiden's autumn thanksgiving celebration in 1617 was the occasion for sectarian disturbance that appears to have accelerated the pilgrims' plans to emigrate to America. 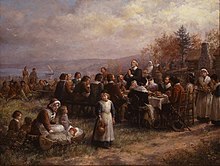 Later in Massachusetts, religious thanksgiving services were declared by civil leaders such as Governor Bradford, who planned the colony's thanksgiving celebration and fast in 1623. The practice of holding an annual harvest festival did not become a regular affair in New England until the late 1660s. Thanksgiving proclamations were made mostly by church leaders in New England up until 1682, and then by both state and church leaders until after the American Revolution. During the revolutionary period, political influences affected the issuance of Thanksgiving proclamations. 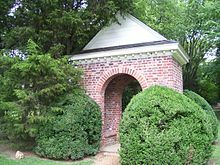 Various proclamations were made by royal governors, John Hancock, General George Washington, and the Continental Congress, each giving thanks to God for events favorable to their causes. As President of the United States, George Washington proclaimed the first nationwide thanksgiving celebration in America marking November 26, 1789, "as a day of public thanksgiving and prayer, to be observed by acknowledging with grateful hearts the many and signal favours of Almighty God". The earlier Thanksgiving celebrations in Canada has been attributed to the earlier onset of winter in the North, thus ending the harvest season earlier. Thanksgiving in Canada did not have a fixed date until the late 19th century. Prior to Canadian Confederation, many of the individual colonial governors of the Canadian provinces had declared their own days of Thanksgiving. The first official Canadian Thanksgiving occurred on April 15, 1872, when the nation was celebrating the Prince of Wales' recovery from a serious illness. By the end of the 19th century, Thanksgiving Day was normally celebrated on November 6. However, when World War I ended, the Armistice Day holiday was usually held during the same week. To prevent the two holidays from clashing with one another, in 1957 the Canadian Parliament proclaimed Thanksgiving to be observed on its present date on the second Monday of October. Thanksgiving in the United States was observed on various dates throughout history. From the time of the Founding Fathers until the time of Lincoln, the date Thanksgiving was observed varied from state to state. The final Thursday in November had become the customary date in most U.S. states by the beginning of the 19th century, coinciding with and eventually superseding the existing holiday of Evacuation Day (a day commemorating the British exit from the United States following the Revolutionary War). Modern Thanksgiving was first officially called for in all states in 1863 by a presidential proclamation of Abraham Lincoln. Influenced by the campaigning of author Sarah Josepha Hale, who wrote letters to politicians for around 40 years trying to make it an official holiday, Lincoln proclaimed a national Thanksgiving on the final Thursday in November, explicitly in celebration of the bounties that had continued to fall on the Union and for the military successes in the war. Because of the ongoing Civil War, a nationwide Thanksgiving date was not realized until Reconstruction was completed in the 1870s. In the Australian external territory of Norfolk Island, Thanksgiving is celebrated on the last Wednesday of November, similar to the pre–World War II American observance on the last Thursday of the month. This means the Norfolk Island observance is the day before or six days after the United States' observance. The holiday was brought to the island by visiting American whaling ships. 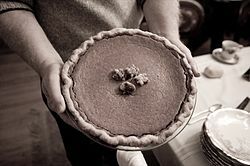 Pumpkin pie is commonly served on and around Thanksgiving in North America. Thanksgiving (French: l'Action de grâce), occurring on the second Monday in October, is an annual Canadian holiday to give thanks at the close of the harvest season. Although the original act of Parliament references God and the holiday is celebrated in churches, the holiday is mostly celebrated in a secular manner. Thanksgiving is a statutory holiday in all provinces in Canada, except for New Brunswick and Nova Scotia. While businesses may remain open in these provinces, the holiday is nonetheless recognized and celebrated regardless of its status. In the West Indian island of Grenada, in the Caribbean, there is a national holiday known as Thanksgiving Day which is celebrated on October 25. Even though it bears the same name, and is celebrated at roughly the same time as the American and Canadian versions of Thanksgiving, this holiday is unrelated to either of those celebrations. Instead the holiday marks the anniversary of the U.S.-led invasion of the island in 1983, in response to the deposition and execution of the socialist Grenadian Prime Minister Maurice Bishop by a military government from within his own party. In the West African country of Liberia, which began in 1820 with the colonization of freed African Americans (Americo-Liberians) from the United States, Thanksgiving is celebrated on the first Thursday of November. Many of the Pilgrims who migrated to the Plymouth Plantation had resided in the city of Leiden from 1609–1620, and had recorded their births, marriages, and deaths at the Pieterskerk (St. Peter's church). 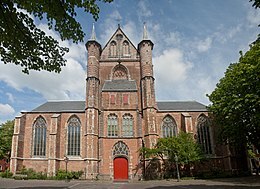 To commemorate this, a non-denominational Thanksgiving Day service is held each year on the morning of the American Thanksgiving Day in the Pieterskerk, a Gothic church in Leiden, noting the hospitality the Pilgrims received in Leiden on their way to the New World. Besides this, Thanksgiving is observed by orthodox Protestant churches in The Netherlands on the first Wednesday in November (Dankdag [nl]). It is not a public holiday. Those who observe the day either only go to church in the evening or take the day off and go to church in the morning (and occasionally afternoon) too. The Philippines, while it was an American colony in the first half of the 20th century, celebrated Thanksgiving as a special public holiday on the same day as the Americans. During the Japanese occupation during World War II, both the Americans and Filipinos celebrated Thanksgiving in secret. After Japanese withdrawal in 1945, the tradition continued until 1965. It was revived by President Ferdinand Marcos, but on every September 21, when martial law was imposed in the country. After Marcos' ouster in 1986, the tradition was no longer continued. The nation of Saint Lucia celebrates Thanksgiving on the first Monday in October. Thanksgiving, currently celebrated on the fourth Thursday in November by federal legislation in 1941, has been an annual tradition in the United States by presidential proclamation since 1863 and by state legislation since the Founding Fathers of the United States. Historically, Thanksgiving has traditionally been a celebration of the blessings of the year, including the harvest. What Americans call the "Holiday Season" generally begins with Thanksgiving. 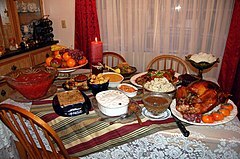 Thanksgiving is celebrated both with family and in public places with parades such as Macy's Thanksgiving Parade in New York City, ABC Dunkin' Donuts Thanksgiving Day Parade in Philadelphia, America's Hometown Thanksgiving Parade in Plymouth, Massachusetts, McDonald's Thanksgiving Parade in Chicago, and Bayou Classic Thanksgiving Parade in New Orleans. This first day after Thanksgiving Day—Black Friday (shopping)—marks the start of the Christmas shopping season. The Harvest Thanksgiving Festival, Erntedankfest [de], is a popular German Christian festival in early October. The festival has a significant religious component, and unlike its North American counterpart, it usually does not include large dinners. 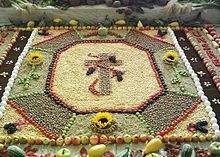 Many churches are decorated with autumn crops, beautifully arranged in front of the altar. In some places, there are religious processions or parades. Many Bavarian beer festivals, like the Munich Oktoberfest, take place within the vicinity of Erntedankfest. The United States has observed German-American Day annually on October 6, within the vicinity of Erntedankfest, from 1883 until the early 1910s, then again from 1983 to the present day. Labor Thanksgiving Day (勤労感謝の日, Kinrō Kansha no Hi) is a national holiday in Japan. It takes place annually on November 23. The law establishing the holiday, which was adopted during the American occupation after World War II, cites it as an occasion for commemorating labor and production and giving one another thanks. It has roots in an ancient Shinto harvest ceremony (Niiname-sai (新嘗祭)). The Harvest Festival of Thanksgiving does not have an official date in the United Kingdom; however, it is traditionally held on or near the Sunday of the harvest moon that occurs closest to the autumnal equinox. Harvest Thanksgiving in Britain also has pre-Christian roots when the Saxons would offer the first sheaf of barley, oats, or wheat to fertility gods. When the harvest was finally collected, communities would come together for a harvest supper. When Christianity arrived in Britain many traditions remained, and today the Harvest Festival is marked by churches and schools in late September/early October (same as Canada) with singing, praying and decorating with baskets of food and fruit to celebrate a successful harvest and to give thanks. Collections of food are usually held which are then given to local charities which help the homeless and those in need. Thai Pongal is the Harvest Thanksgiving Festival celebrated primarily in India, Sri Lanka, and Malaysia. In other parts of India, a similar harvest festival is celebrated as Makar Sankranti. It is a four-day festival, which according to the Gregorian calendar is normally celebrated from January 14 to January 16. [contradictory] This corresponds to the period from the last day of the Tamil month Maargazhi to the third day of the Tamil month Thai. The festival is mainly celebrated to convey appreciation to the Sun God for a successful harvest. Part of the celebration is the boiling of the first rice of the season consecrated to the Sun – the Surya Maangalyam. The origins of the Thai Pongal festival may date back more than 1000 years. In Western Odisha, the day of Pousa Purnima on the saka calendar is commonly known as Pus Puni. It is marked as a day of thanksgiving to mother nature for a good harvest and is celebrated by making regional food items cultivated and harvested by farmers, all food items are given out and served so that we are being partakers of our plenty. ^ Baker, Chapter 1, especially pp. 12–15. ^ a b Baker, James W. (2009). Thanksgiving: the biography of an American holiday. UPNE. pp. 1–14. ISBN 9781584658016. ^ Mills, David; Neilson Bonikowsky, Laura; McIntosh, Andrew. "Thanksgiving in Canada". Canadian Encyclopedia. Historica Canada. Retrieved October 6, 2017. ^ Kaufman, Jason Andrew (2009). The Origins of Canadian & American Political Differences. Harvard University Press. p. 29. ISBN 978-0674031364. ^ a b c Baker, Chapter 1. ^ Alvin J. Schmidt (2004). How Christianity Changed the World. Zondervan. ISBN 9780310264491. Retrieved January 30, 2012. Their leader, Governor William Bradford, issued a formal proclamation commanding the people to give thanks to God for having received divine protection during a terrible winter and for having received their first harvest. It was also new that the Pilgrims celebrated their thanksgiving by eating wild turkey (an indigenous bird) and venison. ^ Jeremy Bangs. "Influences". The Pilgrims' Leiden. Archived from the original on January 13, 2012. Retrieved September 11, 2010. ^ Bunker, Nick (2010). Making Haste From Babylon: the Mayflower Pilgrims and Their World. New York: Vintage Books. pp. 220–21. ISBN 9780307386267. ^ Bradford, Of Plymouth Plantation, 1620–1647, pp. 120–21. ^ Bradford, History of Plymouth Plantation, pp. 135–42. ^ Kaufman, Jason Andrew (2009). The origins of Canadian and American political differences. Cambridge, MA: Harvard University Press. p. 28. ISBN 978-0674031364. ^ Klos, Stanley. "Thanksgiving Day Proclamations". Presidential Thanksgiving Proclamations. Historic.us. Retrieved October 16, 2013. ^ "John F. Kennedy 35th President, Thanksgiving Proclamation, Nov. 5, 1963". The American Presidency Project. Retrieved November 24, 2016. ^ Wilson, Craig (November 21, 2007). "Florida teacher chips away at Plymouth Rock Thanksgiving myth". Usatoday.com. Retrieved September 5, 2011. ^ Davis, Kenneth C. (November 25, 2008). "A French Connection". Nytimes.com. Retrieved September 5, 2011. ^ "Evacuation Day: New York's Former November Holiday". November 24, 2014. Retrieved April 5, 2019. ^ "Thanksgiving Proclamation by Abraham Lincoln". www.abrahamlincolnonline.org. Retrieved October 30, 2018. ^ "LBJ Signs Bill to Set Up Five 3-Day Holidays". Sarasota Herald-Tribune. via Google News. Associated Press. June 29, 1968. Retrieved December 6, 2011. The bill in question became the Uniform Monday Holiday Act. 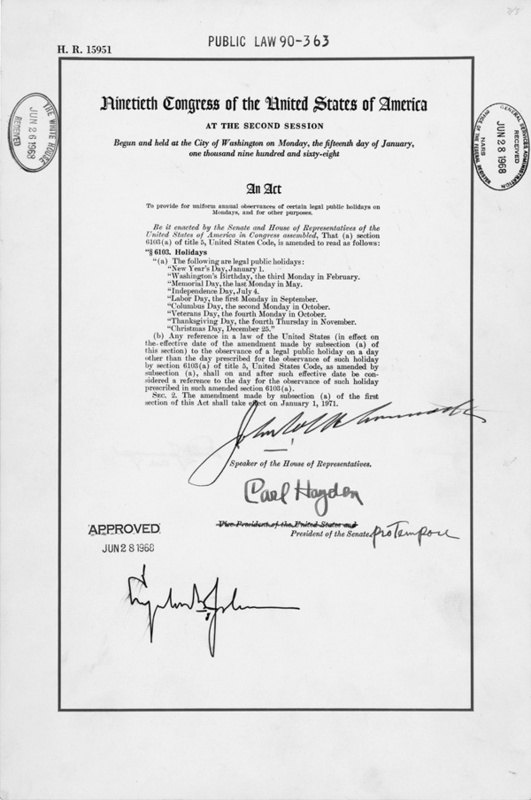 ^ "Text of the 1968 Uniform Monday Holiday Act". US Government Archives (www.archives.gov). Retrieved December 6, 2011. ^ "Norfolk Island Information and Services". Archived from the original on September 20, 2010. ^ "Thanksgiving – is it a Statutory Holiday?". Government of Nova Scotia. Retrieved October 13, 2008. ^ "Statutes, Chapter E-6.2" (PDF). Government of Prince Edward Island. Retrieved October 13, 2008. ^ "RSNL1990 Chapter L-2 – Labour Standards Act". Assembly of Newfoundland. Retrieved October 13, 2008. ^ "Statutory Holidays" (PDF). Ministry of Human Resources and Social Development, Canada. Archived from the original (PDF) on February 29, 2008. ^ "Public Holidays & Events 2017". GOV.gd. October 12, 2016. Retrieved April 17, 2017. ^ "Vice President Boakai Joins Catholic Community in Bomi to Celebrate Thanksgiving Day". The Executive Mansion. Republic of Liberia. November 5, 2010. Retrieved October 5, 2014. ^ "Dutch town". The World (radio program). Retrieved November 28, 2008. The Pilgrims arrived in Leiden in 1609, after fleeing religious persecution in England. Leiden welcomed them because it needed immigrants to help rebuild its textile industry, which had been devastated by a long revolt against Spain. Here, the Pilgrims were allowed to worship as they wanted, and they even published their arguments calling for the separation of church and state. Jeremy Bangs directs the Leiden American Pilgrim Museum. He says the Pilgrims quickly adopted several Dutch customs, like civil marriage and Thanksgiving. ^ "Thanksgiving in the Philippines". Philippine Presidential Museum and Library. Retrieved November 27, 2015. ^ "Saint Lucia's List of Holidays for the Year 2015" (PDF). Stluciachamber.org. Archived from the original (PDF) on March 14, 2016. Retrieved April 17, 2017. ^ "Thanksgiving Day". Encyclopædia Britannica. Retrieved November 25, 2011. ^ Hargis, Toni (November 4, 2013). "A Brit's Guide to the Holiday Season". BBC America. ^ "Macy's Thanksgiving Day Parade". Retrieved April 5, 2019. ^ "6ABC THANKSGIVING DAY PARADE". Retrieved April 5, 2019. ^ "Bayou Classic". Retrieved April 5, 2019. ^ "When is Thanksgiving Day and why is it celebrated". November 22, 2018. Retrieved April 5, 2019. ^ "Harvest Festival UK". Crewsnest.vispa.com. Retrieved April 17, 2017. ^ a b "Meaning of 'Thai Pongal'". The Hindu. Tamil Nadu. January 13, 2008. Retrieved July 4, 2015. ^ "Thai Pongal தை பொங்கல் Festival 2015 | University of Sri Jayewardenepura, Sri Lanka". Retrieved July 4, 2015. ^ "Washington Embassy celebrates Thai Pongal | Embassy of Sri Lanka – Washington DC". Retrieved July 4, 2015. ^ "Malaysian Prime Minister Greets Ethnic Tamils on Pongal". Retrieved July 4, 2015. ^ "Pongal – Harvest Festival". pongal-festival.com. Baker, James W. (2009). Thanksgiving: the biography of an American holiday. UPNE. p. 273. ISBN 978-1584658016. Bangs, Jeremy D. "Thanksgiving on the Net: Roast Bull with Cranberry Sauce". Sail 1620. Society of Mayflower Descendants in the Commonwealth of Pennsylvania. Archived from the original on November 2, 2012. Retrieved October 23, 2012. Colman, Penny (2008). Thanksgiving: The True Story. Macmillan. p. 149. ISBN 978-0805082296. Dow, Judy; Slapin, Beverly (June 12, 2006). "Deconstructing the Myths of "The First Thanksgiving"". Oyate.org. Archived from the original on November 29, 2010. Retrieved November 29, 2010. Hillstrom, Laurie Collier (2007). The Thanksgiving book: a companion to the holiday covering its history, lore, ... Omnigraphics. p. 328. ISBN 978-0780804036. Hodgson, Godfrey (2006). A Great and Godly Adventure; The Pilgrims and the Myth of the First Thanksgiving. New York: Public Affairs. p. 212. ISBN 978-1586483739. This page was last edited on 8 April 2019, at 23:34 (UTC).